Getting Doug with High Featuring Colorado Cannabis Tours! Doug Benson took the Getting Doug With High show on the road in May, and the first out-of-state show was filmed in Denver, CO. SexPot Comedy presented, and fans of the show turned out to pack the Oriental Theater. Colorado Cannabis Tours booked marijuana-friendly lodging for Doug and his crew while they visited Denver, and also hosted Gabe the Magician on one of our tours. 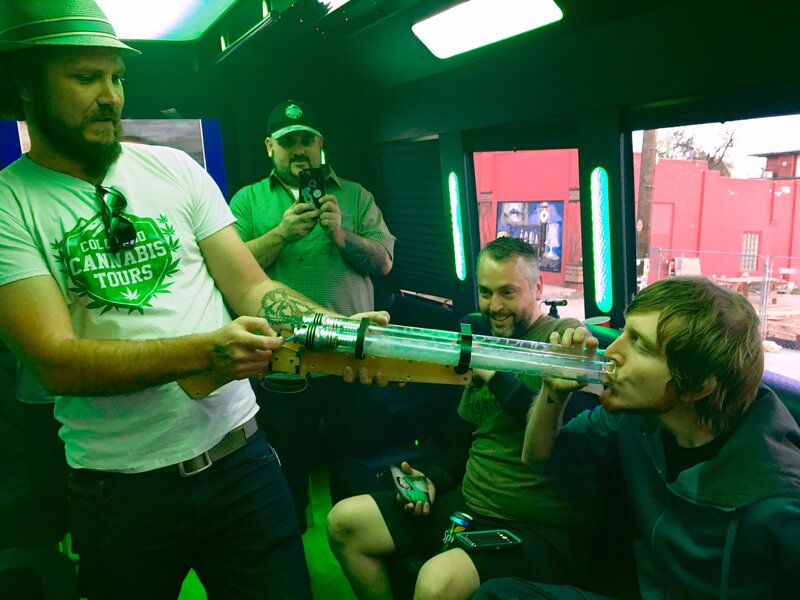 CCT provided the HotBox party bus for fans and VIP members of Doug’s show in front of the theater where patrons were able to utilize the party bus for private and lawful cannabis consumption before, during and after the show. The HotBox is a mobile venue for cannabis available for shows and special events. That night on the HotBox, I was standing in the aisle passing a bong around to some of the guests, when Doug came on board and started walking toward the back. “Hi Doug. Are you high yet?” I asked as I held out the bong toward him. “We need to fix that” I said as he took the bong from me. “Indeed we do,” was his reply as he started to toke. After taking a hit, he handed the bong back to me and made his way to the back of the bus where he greeted guests and continued to take people up on their offers of joints, dabs, hits from the double barrel Incredibowl. You can imagine it being a point of pride for any stoner to be able smoke out Doug Benson. After speaking to everyone in the HotBox and signing autographs, Doug took the stage and started the show. He gave Colorado full credit for being a marijuana Mecca, and gave the Colorado Cannabis Tours HotBox a shout saying he had just come from our bus where he smoked around 20 joints and 2 dabs. Still adjusting to the liberal atmosphere, he expressed doubt that boarding the HotBox and doing the show and was “completely okay to do”. In fact, when he was on the HotBox he told this privately to Mike Eymer, wondering if all of his would get him in trouble. Mike told him that at most he faced a $150 ticket for public consumption. Since he proceeded with the show exactly as planned, it seems he must have figured that the potential consequences were worth the risk. Colorado Cannabis Tours was thrilled to be involved with the Getting Doug With High in Denver show. Doug, Gabe, the guests of the show, and the entire crew were incredibly friendly and approachable. For example, after the show they all got on the bus again to hang out with everyone, even though they didn’t have to. When Gabe came on our tour, he was amazing. We got to spend all day with him showing him the best of the Colorado Cannabis scene, and giving him the ultimate Denver tour. Watch the show for the best trick Gabe has ever done. The Getting Doug in Denver was filmed on May 9, 2016. It featured GDWH show veterans Kassem G, Todd Glass, Josh Blue & Geoff Tate. Be sure to subscribe to the GDWH show on YouTube and ‘like’ it, as it helps to combat the trolls that try to flag it on YouTube. Puff, Pass and Paint in Washington DC! Puff, Pass and Paint founder Heidi Keyes taught her inaugural class in Washington DC last week. It was held August 19. It was a special class in many ways, the best being that her aunt Gail was able to attend. This unique DC event was held at the Purple Mansion in Columbia Heights. This is the home of the Marijuana Policy Project’s Rob Kampia. The advocacy and hard work that the MPP has done to advance the changes in cannabis laws around the country is outstanding, so the opportunity to hold a ground-breaking cannabis event in that space was one that couldn’t be passed up. So what is Puff, Pass and Paint? Shortly after Amendment 64 came into effect in Colorado in January of 2014, Heidi Keyes began teaching her class after taking a suggestion from a friend who saw the potential in combining two things Heidi was passionate about. She has crafted what many consider the best experience out there in which to get high and be creative with paint. Heidi has continued perfecting the style and format of the class since she started her marijuana-friendly painting class nearly 3 years ago. Classes are held in a private residence. Paints, canvas and brushes are provided, and paintings are taught step by step. The classes are “BYOC” and “BYOB”, where guests are welcome to share amongst themselves if they choose. Washington D.C. passed Initiative 71, a law that made it legal for adults to possess up to 2 ounces of cannabis, and to consume it in a private residence. This made the private party format of Puff, Pass and Paint DC a natural fit for the district. After holding the first class of P3 there it was evident that the community is eager for the chance to socialize and meet others in the context of smoking marijuana. Heidi and I were stopped by a local resident when we were wearing our Puff, Pass and Paint tank tops. Curiosity and enthusiasm for cannabis events seems to be exploding in D.C.. Currently classes scheduled for August and September are sold out! But we will be adding more soon. Check PuffPassandPaint.com for details about upcoming classes. Las Vegas has added a major attraction to the numerous casinos, bars and clubs – a dispensary. It is located between the Stratosphere casino-resort and the SLS Las Vegas casino-resort. Called simply, Essense Cannabis Dispensary, it opened in March of 2016, with an impressive Las Vegas Boulevard address. Owner Armen Yemenidjian hopes that location, location, location is the secret to success. Even though Nevada voted to legalize medical marijuana in 2000, legalities prevented a single dispensary from opening until August of 2015. Medical marijuana dispensaries have been opening there ever since. Essences top cultivation officer aims to have 35,000 cannabis plants by the end of 2016. Yemenidjian sells dried marijuana flowers and cannabis-infused cookies among a plethora of other options to treat pain, nausea, sleep deprivation and others. These products are available to anyone with a medical card, from any state. Because while it is still illegal for medical marijuana card-carrying patients from California and beyond to bring their own medicine over state lines, they can very legally purchase and consume cannabis in Nevada, due to a 2015 law that promised reciprocity. Currently, Essence is sourcing and purchasing its marijuana from independent growers but is in plans to begin growing its own cannabis crop in a 50,000+ square foot facility less than a mile from the store. When fully operational around the end of the year, the computer-controlled facility is expected to grow about 35,000 plants at any given time. Should cannabis be legal for recreational purposes in Las Vegas? We certainly think so. Look to Nevada residents this fall when they will vote on that issue in November. For those of you interested in the cannabis scene in Las Vegas, check out our new endeavor Sin City Cannabis Tours. Most of us remember when Michael Phelps, history’s most decorated Olympian, was exposed as a cannabis user in 2009 via the wide release of a candid photograph of the athlete captured at a party. Phelps was banned by USA Swimming for a total of three months and lost a major sponsor, Kellogg. But most millennials likely don’t remember an even bigger marijuana laced Olympic scandal. It’s going on 20 years since Ross Rebagliati won the first ever gold medal for the sport of snowboarding and it’s going on 20 years since he lost that medal when he tested positive for THC after the win. But Rebagliati didn’t win gold by giving up. And he wasn’t going to go down without a fight. Rebagliati maintained that he hadn’t used cannabis recently enough to affect his Olympic performance. In 1998, prior to heading to Nagano, Japan – where the games were being held that year – Rebagliati attended a gathering. At this gathering, he maintains to this day, many of the people in close proximity were using cannabis, but he wasn’t. He feels that must have been what the test registered. In fact, when the test results were revealed, Rebagliati’s reading of 17.8 nanograms per milliliter was just over the then regulated allowance of 15 ng/ml. The World Anti-Doping Agency, the body in charge of global drug testing for Olympic sports, has only changed the threshold for THC within the last 5 years, to a whopping 150 ng/ml. That’s ten times higher than their previously set limit. A spokesperson for WADA, Ben Nichols, says that now they are only testing for current use. After a successful appeal, Ross Rebagliati regained his gold medal -and a seed had been planted. He believed in cannabis and it’s medicinal values. Read more Ross Rebagliati’s story on the Ross’ Gold website and look below to watch a brilliant video, Carving on Cannabis with a Snowboard Gold Medalist by VICE food channel, Munchies. Bec Koop wanted to bring the cannabis out of the shadows and make it a part of the celebration. 2014 turned out to be the year she did it. “I sometimes joke: With every single wedding that we’ve been to, there’s probably been at least one person out in the car in the parking lot getting high,” Koop said in a recent interview with The Cannabist. And she’s right, isn’t she? Some alcohol lovers will carry a flask on their person – how is bringing a joint in your purse any different? Marijuana’s reputation with nay-sayers is constantly improving and I’m sure many of the folks in the cannabis community expect that pot will be legal, nationwide, before it is all said and done. And they are probably right too, aren’t they? So why shouldn’t Koop pair two things she loves – floral arrangements and cannabis. It takes a lot of guts to start your own business, even more guts to start a business that essentially chucks federal law out of the window. But that is just what Koop did in 2014 and has been making an impact since. Even so, there was still a void in the wedding market. I remember hearing a friend say Bec was going to be doing her wedding – but how would OTHER people hear? How would enough people to support a growing business hear about Bec’s company, Buds and Blossoms? We were pleased to find out that with co-founders Philip Wolf (Founder of Cultivating Spirits) and Nicki Usbay (Founder of LoveAndMarij.com) Koop found just the partners she needed to make a cannabis wedding expo daydream into a reality. Yes, a cannabis wedding expo – the first in fact. It would be like every other wedding expo with vendors to help plan, feed, entertain and indulge yourselves and your guests on your special day. It would also have a place for on-site cannabis consumption. There would also be cannabis bouquet/boutonniere displays. And don’t forget cannabis budtenders available for hire, to help make strain selection less strenuous for your future wedding guests. Speakers would round out the expo events with advice from cannabis wedding brides-to-be and an educational chat about the effects of using marijuana and alcohol simultaneously. It sounds like something a cannabis loving bride and groom only day-dream about – sharing a joint instead of raising a glass at their reception. But with the effort from these three – Koop, Wolf and Usbay – marijuana infused weddings did get their day in the sun. January 17, 2016 marked the day of the inaugural Cannabis Wedding Expo! One can only hope it won’t be the last. In North Charlotte, North Carolina, one Kabuto Japanese Steakhouse and Sushi Bar is taking a stance. Things can get tense at the steakhouse, and they saw only one option available to them to rectify the problem. This Kabuto has railed against against hoodies…and weed. For several years, franchise owner Martin Tanaka has displayed a small sign in his restaurant. Recently, he decided to more prominently display his message, increasing the sign in size and placing it right next to the eatery’s front door. Mr. Tanaka minces no words when it comes to the rules of his restaurant. Atlanta PR professional Angela Hong shared this snap on her Twitter account earlier this year. What is a chatty stoner on the phone wearing a hoodie and hip huggers to do? Tanaka says there is a place for hoodies and marijuana smoking – but that place is not his kind of place. While some of the public featured on the WSOC9 news story featuring the Kabuto Japanese Steakhouse sign thought Tanaka was well within his rights (and right mind) to put up such rules, others felt the move was more racially driven than anything else. We think the Kabuto Japanese Steakhouse and Sushi Bar on at 1001 East W.T. Harris Blvd in Charlotte, NC probably does have the right to require dress codes and…smell codes? You know those signs some businesses display, “No Shirt, No Shoes, No Service” right? Well, it is because businesses CAN refuse service to people, on their own discretion for the most part. Also, we don’t think we will ever be giving them of our business. A recent study including over 215,000 adolescents spanning the 50 states is giving cannabis consumers good news. While the moral majority assumed and asserted that marijuana legalization would lead to an increase in use among children and teens, the study conducted at Washington University School of Medicine in St Louis discovered a very different story coming together. Cannabis problems are declining in states that have legalized – and beyond. The study took place over a 12-year span of time. During that time , participants ranging in ages 12 -17 were questioned on how often the used cannabis. The data collected was examined to determine if marijuana legalization (medical or otherwise) was having a positive, negative or neutral effect on today’s youth. In those 12 years, scientists did see a trend. Between 2002 and 2013, the amount of adolescents who reported having problems with marijuana declined a whopping 24 percent. There was also a noticeable decline (10 percent) in the number of adolescents that reported using the drug at all in the past year during the 2002-2013 time frame. How do you think marijuana legalization will affect the use of marijuana among youths? Do you think this is just an issue of recognizing mental health issues early on and treating them? Let us know what you think on our Facebook page! It is a very scary word associated with an experience most people hope they will never have to personally deal with. Melanoma, or skin cancer, is something anyone can get because you can develop it simply from exposure to UV rays. Do you frequently go outside for long periods of time without first applying a liberal amount of UV sun protection? If so, you have been putting yourself at risk for developing melanoma. Do you like to visit the tanning salon during winter months to keep that bronze tone? If so, you are drastically increasing your chances of developing skin cancer. What is there to do to protect yourself from melanoma, other than sunscreen and avoiding tanning beds at all costs? Believe it or not, cannabis just might do the trick! A study profiled in the Journal of Investigative Dermatology showed that when mice with melanoma cells were treated with a combination of both THC and CBD, those melanoma cells began to die. Now, another study has come to light, showing again that THC has a positive effect on the treatment of skin cancer (in mice). …or, HEY! THC kills skin cancer everyone! This is good news but it doesn’t actually PROVE anything YET! First, it has been replicated multiple times, otherwise it just isn’t confirmed science. And they weren’t wrong. Lots of people did come for the free samples – and many of them got them. Sure there were non-infused confections, cookies and chocolates to choose from at vendor booths – that wasn’t what bothered the police. Instead, they were there to address the attendees who were at the trade show to obtain “free” cannabis in their VIP swag bags (total cost of weekend ticket and gift bag, plus networking and party invites was $299). On one hand, you have to respect Wray’s tenacity. He wants to bring cannabis to the masses – he wants to work on progressing cannabis acceptance. On the other hand, Wray is breaking a resolution to the Alaskan law which passed possessing and gifting 1 ounce or less of marijuana. Because in preparation for the abundance of samples expected at last years NCC trade show, the Anchorage Assembly prohibited cannabis samples during trade shows inside any municipal building. And the same rules applied this year – no free weed. But that’s not what happened. We will update you as we hear more about this story.